Interclassics Brussels was a couple weeks ago and I was lucky enough to go with Jobjoris since I was already in France for the End of WWI Centenary. This has to be the biggest car show/market I’ve ever been to. 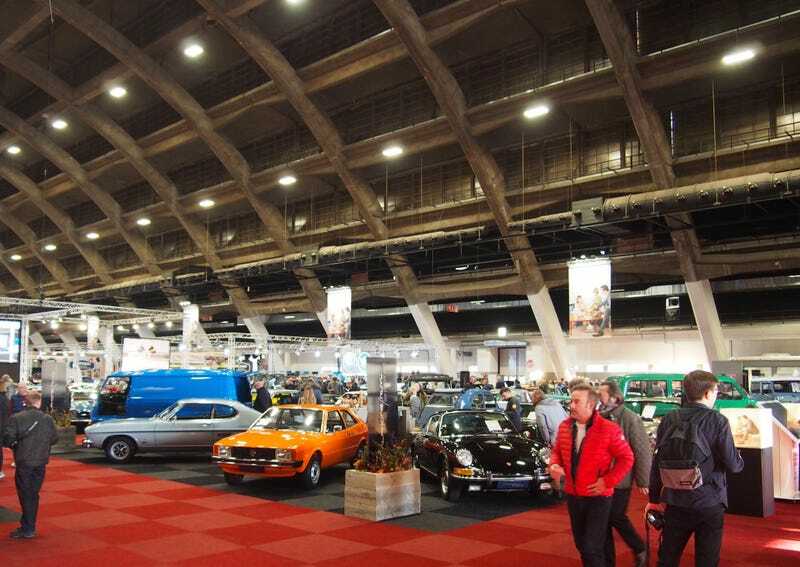 Three huge halls filled with every classic European (and some American) car you can think of plus some. Most of them for sale. It’s held in the imposing and huge Brussels Expo building which was built in the mid 30's for a world’s fair. The architecture gives off that “World War II is coming” vibe. World Expo ‘58 was also held here and that’s when they put up the amazing Atomium nearby. Anyway, this time of year it holds lots and lots of awesome cars. Here’s a bunch of pictures of them. This Iso Isocarro 400 truck was one of my favorites. It looks like a grasshopper. Here it’s serving coffee. This ‘64 Iso Rivolta GT also has an insectoid face. This 1970 Monteverdi 375L High Speed was a magnificent beast. So much so, my camera seemed unable to focus on it. Powered by a 7.2 liter V8, so I believe the high speed part. Beautiful blue Glas 1700 GT. A Messerschmitt KR200 with an added convertible top. This is pretty common when the original plexiglass domes break. This is a rare 1939 NSU/FIAT 500 A Weinsburg. These were license built Topolinos manufactured in Germany by NSU. A 1975 Audi 100 Coupé S. A very handsome car that was apparently terrible. A beautiful BMW 700 Coupe. This was the car that put BMW back on track in the 50's. Belgian built 1925 Minerva AB Roadster that’s apparently only had 4 owners since new. 1967 Fiat Dino Coupé. I like it in yellow. This is a 2600 Berlina from 1962, one of Alfa’s oft forgotten “big” saloons. I thought this Michelotti designed Lancia Appia Convertible was one of the prettiest cars in the place. A Maserati 4000 with a healthy amount of patina. This car came from Florida, so it’s a good thing it’s fiberglass. The very first Alpine, the A106. 1937 Delage D8-120 Cabriolet with coachwork by Chapron. Never seen one of these before. An Artega GT. 1972 Lancia 2000 Berlina. This car looks like it was built 10 years earlier. It is pretty, though. Another favorite of mine was this 1955 Fiat 1100 TV Transformabile. Fiat 2300 Berlina. I don’t know what pissed it off. BMW 1600 GT. After BMW bought Glas, they kept building these beautiful cars for a whlle powered by their own 1600 motor. A little smaller than the old Glas engine, but easier to manufacture since most stuff at Glas was still built by hand. A rare Rumi Formachino scooter. An another awesome Michelotti design, the Fiat Shellette.